Eastern Newts are common amphibians inhabiting the wet zones in eastern ranges of North America. They are extremely popular as pets. They are known for their interesting life cycle which keeps shifting between land and water. Their appearance is also affected in different stages of their lives by which they can be distinguished. It is also called the red-spotted newts according to some sources. Several patterns and coloration can be observed during their lifetime, following the 3 phases of their life. Size: Adults can attain a length of 5 inches during their life. As efts they range between 3.8 and 9 cm in size. Color: In the larvae stage, they exhibit a greenish brown color but after reaching the eft stage, they become orange-ish with several spots of red on them. Patterns can vary according to the subspecies. As it matures into adult, a greenish hue is adorned by it along with black spots. Tail: It has a flat tail which is different from the eft stage. Eastern Newts are highly common in North America’s eastern fringes. This species of salamanders is widespread from Canada’s Nova Scotia to Texas and Ontario. Wet forests furnish them with ideal conditions for living. They inhabit muddy areas that are closer to water sources. During rains, they stick to muddy regions and when it is dry, they prefer to be on land. Deciduous as well as coniferous forests are their homes, throughout their range of distribution. In their adult phase they make swamps, floodplains, marshes and creeks their home. They are found in plenty in the areas devoid of much fishes but full of vegetation. Efts prefer woodlands that lie close to the habitats of the adults. 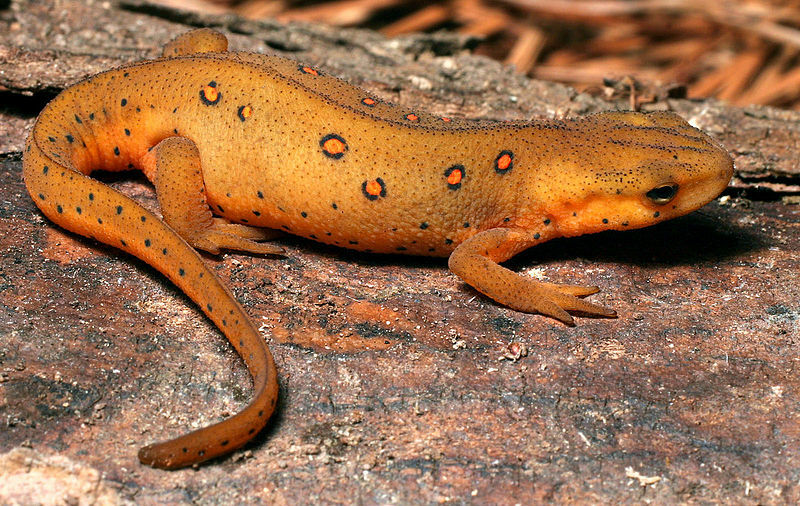 The behavioral pattern of eastern newt is quite different from that of other amphibians. Find out more in the following points. 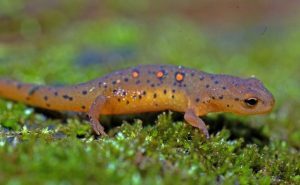 Strangely enough, it has poison underneath its skin which glows and warns the predators about the impending danger they might face if they come close to the newt. They produce poison in all three stages but the highest toxins are produced when they turn efts. During eft stage, it takes on long journeys visiting one pond after the other till it finally settles in one in which complete transformation occurs. Their feeding pattern and behavior is dependent on visual hints and clarity of water along with temperature. When females start looking for a prospective partner for copulation, spots on the male’s hind legs attract her. Other mating rituals involve wiggling of the male’s tails which produces a smell which attracts the female. For signaling its willingness to breed, the newt makes with fan their tails which become broad by that time. They live with other aquatic creatures like non-carnivorous fishes in rivers and ponds. They are generally active creatures, walking around their habitats. Red efts hibernate during winter, taking refuge under huge rocks or logs. It has been observed that those belonging to the northern regions do not truly hibernate and remain active during winters. Diet of the adult Red Newts comprise crustaceans and aquatic insects, eggs of frogs and worms whereas that of the Red efts comprises small insects, snails and worms. Common predators of these newts are the carnivorous and omnivorous fishes, mammals, birds and amphibians apart from the natural dangers which arise due to habitat destruction. They have a few but strong adaptive measures in the wild. These newts become brightly colored on sensing danger due to the presence of poisonous skin. When these creatures get back to aquatic habitats for reproducing, a big tail fin grows on them allowing them to survive. Poison underneath their skin helps them save themselves from a range of small predators. By the age of three, these newts attain sexual maturity when they participate in the process. Breeding season continues till spring beginning during the last phases of winter. After the initial mating rituals are over, the female fertilizes her eggs with the help of the sperm deposited by the males in floors of the water bodies. It breeds between 200 and 400 at a time. These eggs are then left to hatch among which only 2 percent of the tadpoles grow up to become efts. After the initial fertilization of her eggs, number of eggs laid reduces to the minimum. They have 3 stages of life which are the tadpole stage, juveniles or red eft and adult stage living an aquatic life. After the eggs have been laid by the females, it takes a month or two for them to hatch. 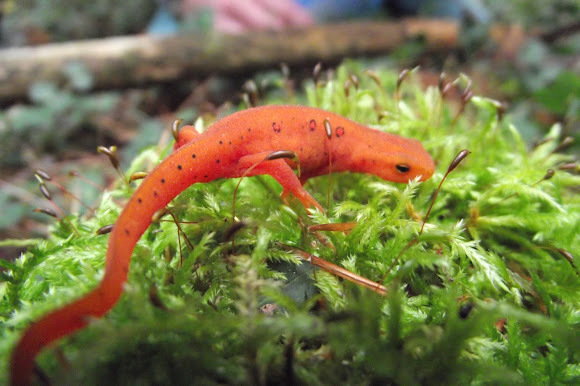 Larvae of the length of 1/2 inch are born which transform into red colored efts moving out of water into the land. As efts they live for years on land, during which their gills are lost. After living on land for almost 4 years they hark back to water as adults. These newts live in the wild for almost 15 years. 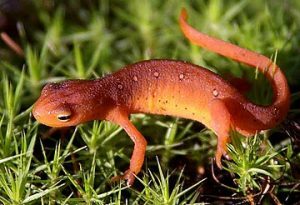 There are 4 subspecies exist of the Eastern Newt. Place them in large aquariums having equal proportions of water and land. Make sure that it is protected from direct rays of the sun as they prefer cooler areas. A 10 gallon tank can house 3 of the creatures. Feed the efts with pin-head crickets and flightless flies apart from small earthworms. Food for the grown-ups comprises earthworms, ghost and brine shrimps. Small fishes like guppies, white-worms, tubifex and blood-worms can also be fed to them. At regular intervals, clean up the sand and gravel contained in the aquarium. Keep the aquarium well covered to curb their truant tendencies. These amphibians have been listed under Least Concern species by the IUCN as they are abundant in southeastern parts of Canada and eastern regions of United States. Find out some extremely interesting facts about the Eastern newt. It is assumed that these newts find their way or navigate via ferromagnetic materials which are contained in its body. A typical courtship dance takes place for mating when the females are entangled by the male’s hind legs. They can be spotted in the waters swimming during summers and sometimes also during winters. Kids love watching them. The name, Eastern Newt may suggest the existence of a Western Newt but there is no such newt in existence. You can buy them as pets from various online sales. Here are some images of the Eastern Newts.